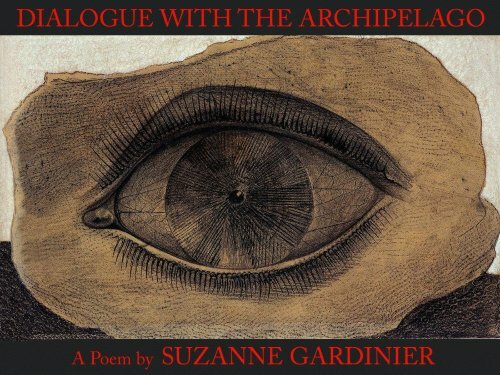 "Dialogue with the Archipelago is full of private mythology Suzanne Gardinier grafts on to matters modern, Biblical, and ancient. She has invented a line appropriate to her poetry ruled by a two-faced moon that keeps and holds every word precious and resonant, broad enough to hold the surf of history crashing with an emotional sweep, depth and beauty few contemporary poets can provide. Of course, her moon makes for breakers mysteriously regular and irregular. Of course, Suzanne Gardinier's mind to her 'a kingdom is.'" Letter August 19 2003 "Spent part of yesterday reading the 'Archipelago.' It seems to me a great public poem, a kind of cantata of outrage, grief and love. I can imagine a composer who would set it to music, but it already has its own music. I will nit-pick a little, but it seems to me you have fabricated (as in 'il miglior fabbro') something here which coheres amid incoherency, the arc holds from beginning to end." The title of this book arrived before the rest, as I took the train home from the memorial service for my beloved college French teacher Ilona Coombs. At the gathering I'd learned that in spite of her accent and her justice-minded elegance, she was not originally from Paris but from Greece: born in Lesbos, her mother also, her father a Hungarian Jew. During World War 2 her father died of a heart attack as they hid in Athens; she and her mother were still there after the war had ended, in the new war between the Greek left and right, each backed by allies elsewhere, the left by Soviet-bloc countries and the right by Great Britain and the United States. At some point Ilona's mother was standing by their window in Athens, and was shot by a sniper and killed. She ran panicked into Syntagma Square and into the Hotel Grande Bretagne for help, literally into the arms of Charles Coombs, who was working for US intelligence services there; thirty years later he was still her husband, when I visited her house in Morristown, New Jersey, with so little idea of who she was. Dialogue with the Archipelago is a long poem puzzling over these mysteries: of those who come before you and those after, of identity, of love, of power, of Greece. it exhausts my elbows and I don’t know where to put it down. Présences je ne ferai pas avec le monde ma paix sur votre dos. And so I walked back along those long and lonely blocks to the store. And in through the door. And up, face to face, with the member of that small community who owned the store. And I said: I stole this knife and I am sorry and I am bringing it back. And he said: Thank you. The knife is not very important, but you coming down here and saying that to me is very important. Remembering all that, I know why I do not want the empire. There are better ways to live and there are better ways to die. William Appleman Williams, "Empire as a Way of Life"
Of which I’ll share with you.